Robert Frost’s “Stopping by the Woods on a Snowy Evening” has been on my mind, perhaps because of the recent snow-filled days. The meter, rhyme, and words have always felt just right. They convey not only a picture, but sounds and mood, the tension between journey and destination; they place me on the back of a little horse who waits while I watch—just for a few moments—snow falling gently in the woods on a long, dark night. Our apple tree, not in the woods, or at night, but covered with soft snow. The poem’s resonance varies. The nature loving adventurer within me wants to plunge into the woods that are lovely, dark, and deep. Late nights diligently working towards deadlines hum with the refrain of promises to keep and miles to go before I sleep, while my deepest depressions have despaired at those same words, same miles in darkness. Michael imagined that life would slow down when we had a child. Then Miguel was born, and we shifted into hyperdrive. While I wouldn’t trade the ride for the universe it is speeding through, I appreciate the pauses, especially when they take me away from the village. 97.3% of the time, living car-free and bike-centered in Chicago works just fine, and saves money for splurges like races. Here, Karen is using one of my favorite capacity expanding tricks: tie a bulging plastic bag on the rack on top of a pannier. My family lacks easy access to natural-ish areas within and near Chicago, in part because we chose to live without a car. The metro area oozes miles and miles in all directions but east; even with a transit assist, it takes a lot of time to simply get to an area beyond noise and asphalt. For a day trip that means the getting there (especially with a child) to being there ratio is often not worth it. The flat land of northeastern Illinois is not exactly rife with wilderness anyway. But we have Lake Michigan and a mostly “Open, Free, and Clear” shoreline. While I have no horse, I do have glorious girlfriends who keep me running year round, and sign up for races by the lake, even if it’s just to take a break from routine, get a new shirt, and turn our gaze away from the city to the water. 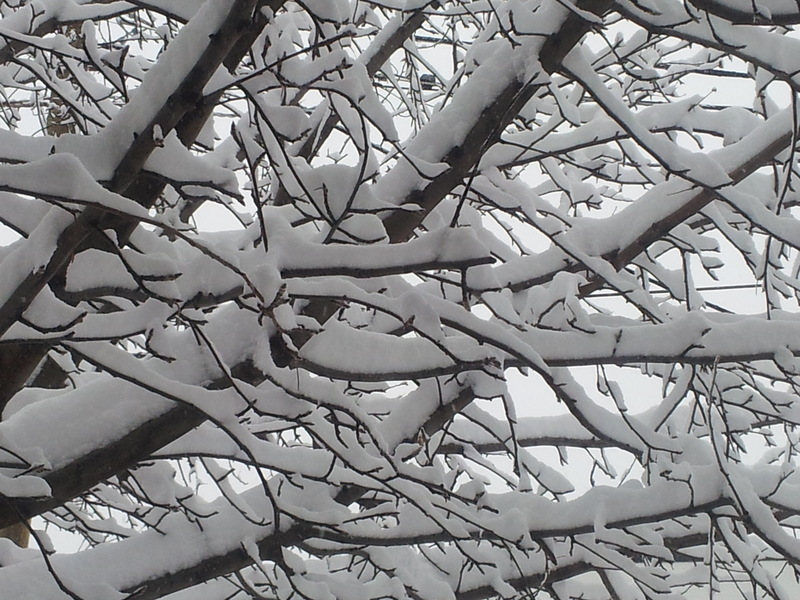 And lately there has been so much snow, soft and deep. The earlyish morning trip downtown, Yeah, yeah, we could have biked. Can I blame the ice for our choice? Well, I intended this post to provide a play by play of my last minute, $68 date with Karen to run the Slushy, Icy, Polar Dash, followed by my more than $68 trip to Trader Joes. Then it got all mushed around when I started wondering about our mellow approach to the race, and why grocery shopping was part of the day’s anticipation. Sure, going to TJ involves leaving the neighborhood, which has become somewhat of a special occasion (through no fault of anything but my laziness). But it’s not like I have a TJ fetish, despite the appealing prices on nuts and dried fruit. I think I grabbed the morning for the pause, not the race. The registration fee was not for the event, but for the time. Time away, time together, time with a few views of nothing but open land and water which soothed the soul even though they were dull browns and whites smudged against the grayest of skies. Time to be leisurely in the grocery store, and consult on future meals to be made for harried weeknights. After we stuffed our saddlebags with provisions, we rode our bikes to the train, which has no bell, but shook us through the deep, dark subway, miles back to our village. 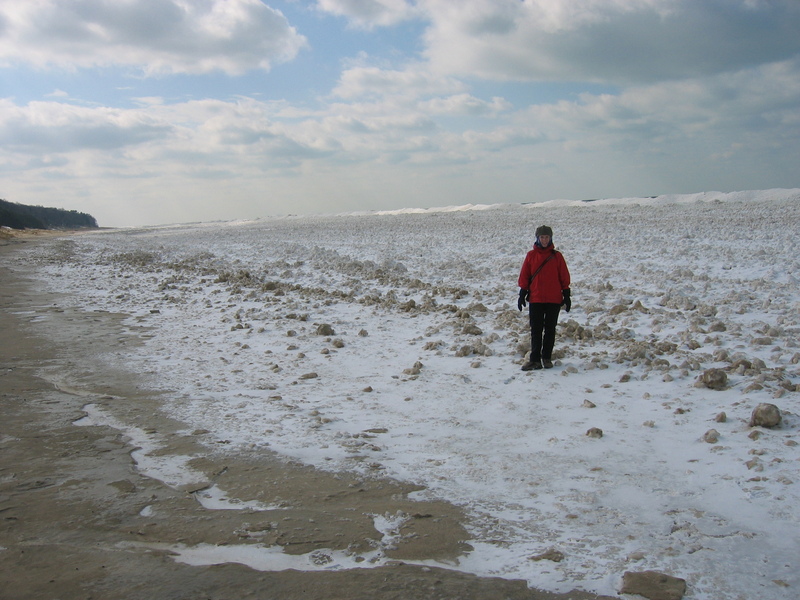 This is a cheat picture b/c it is from the Michigan side, but it is the only frozen Lake Michigan pic I can find. 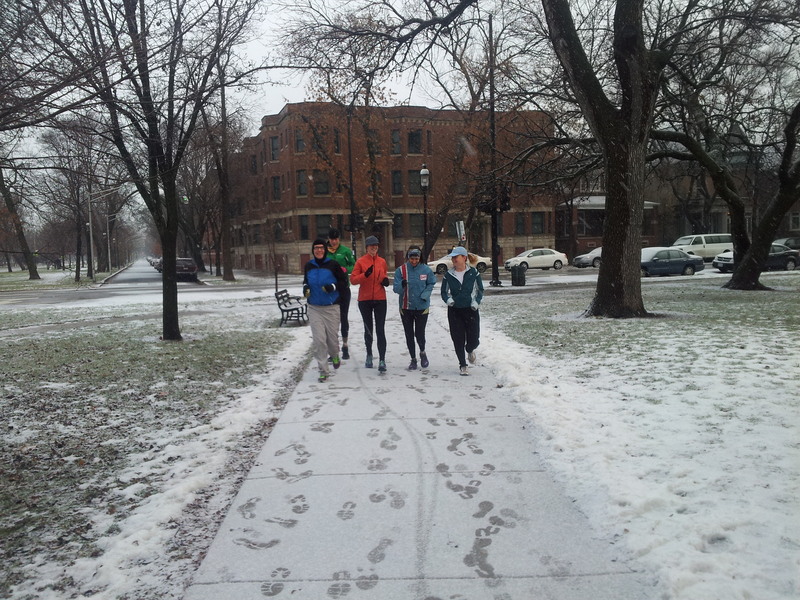 And, in truth, we have some lovely places to run in our area: Palmer Square, Humboldt Park, the boulevards. But nothing quite beats the lake. Except maybe mountains. Why do I live somewhere without mountains? So what are your woods? What tempts you? Hmmm, good question. I guess I want to be in the poem’s woods. Barring that, pretty much anywhere unmarred by noise from machines. Wow, beautiful words, Gin. Just gorgeous. I love the way you write about all the reasons we run that have nothing to do with running, which is mostly why we run in the first place. 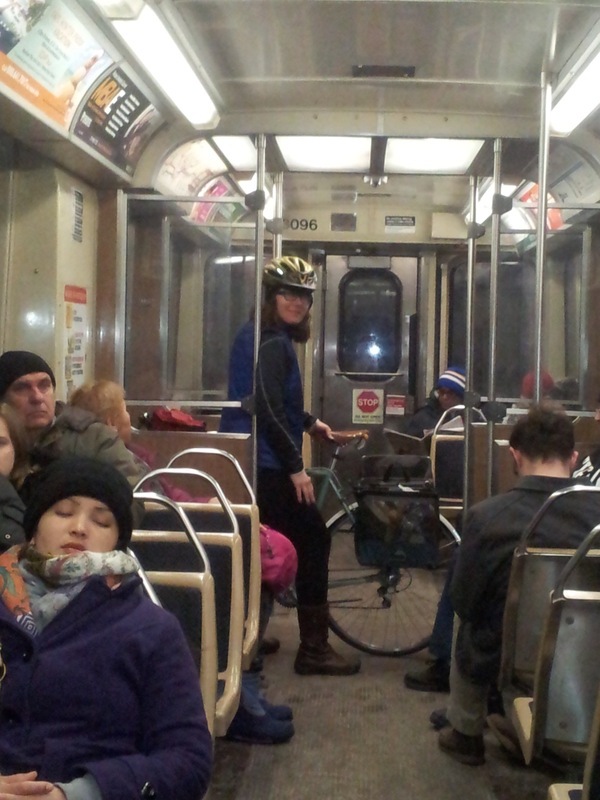 Also, that pic of Karen on the train is priceless! Thanks, Clare. Here’s to a lot more running pauses. Even though I have given up on 6:15 for now, let’s start getting in the long runs on the weekend. This is a challenging literary amalgam of classic poetry, running in a marathon and a mundane shopping trip to Trader Joes, set against the background of a Chicago winter. I myself would never have thought to combine such unrelated concepts. There are some excellent “Frostian” allusions: “working towards deadlines hum with the refrain of promises to keep and miles to go before I sleep…” but as Gin says herself, it doesn’t hang together so well. I’m afraid I have to agree. Love you, Jim. Keep keeping me honest. What do they say? Better to have written and lost than to not have written at all. Though one could argue that not everything needs to be shared. 🙂 If I worked on this again, I would probably slash a lot.